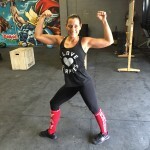 My CrossFit journey began in 2013 when I bought a Groupon for CrossFit Nassau. After that, I never looked back, I was hooked. I love trying new things and pushing my limits to see what I am truly capable of. CrossFit has helped me to do just that!! It has forced me to step outside my comfort zone. It’s helped me to not only build strength but also build my confidence. I have not mastered everything by far, but each day I attempt new things that I never thought possible. Even when I fail, I look back, grateful in my attempt and know that I will try again tomorrow. In 2015, I completed my Level 1 certifications and now I have the pleasure of coaching at CrossFit Nassau.